Audiobook Cover: "Audiobook nation, in the history of mankind there has never been a country better than America at being #1 at greatness. But as perfect as America is in every possible way, our country is broken! (And we can't exchange it because we're 236 years past the 30-day return window.) Look around---we don't make anything anymore, we've mortgaged our future to China, and the Apologist-in-Chief goes on world tours just to bow before foreign leaders. Worse, the L.A. Four Seasons Hotel doesn't even have a dedicated phone button for the Spa. You have to dial an extension! Where did we lose our way?! Luckily, America Again is here to single-audiobookedly pull this country back from the brink. It features everything from my thoughts about the one thing to my thoughts about that other thing, and gives America the dose of Truth it needs to get back on the right track it's already on." Taryn's Review: Let it be known before this review begins: I adore Stephen Colbert. Why it didn't dawn on me to listen to his first book I Am America and So Can You! is beyond me, and it is positively shameful on my part. Stephen Colbert reading his own words about his own opinions on everything? I love it. This book was definitely more biting than his first book, and his jokes in this book pushed the boundaries more than the first book did. I personally like the sassier Stephen Colbert of America Again and this book had me laughing out-loud during my commute to-and-from work. Part of Stephen Colbert's charm for me is the way he slyly includes quips that are downright genius. Pay close attention or you'll miss some good ones. Why not 5 stars then? Every now and then the book featured a section called, "My Turn." Colbert portrayed various people and read emails that they supposedly wrote to Stephen. I didn't enjoy these bits and I really didn't find them too funny. I listened to a few, but by the end of the book I was skipping the "My Turn" segments completely. 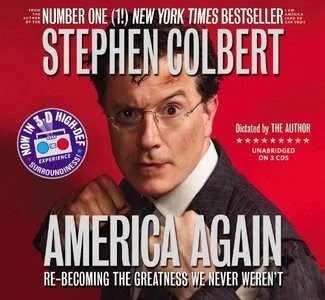 Ultimately it's no surprise that I loved this audiobook and I imagine that anyone who enjoys The Colbert Report will delight in this witty and sharp book. A special guest whose voice I recognized was a fantastic inclusion and the guest provided ample laughs. Stephen Colbert and his character will be missed when his show permanently wraps up at the end of this year, but these books are an awesome representation of why we adore The Colbert Report so very much.